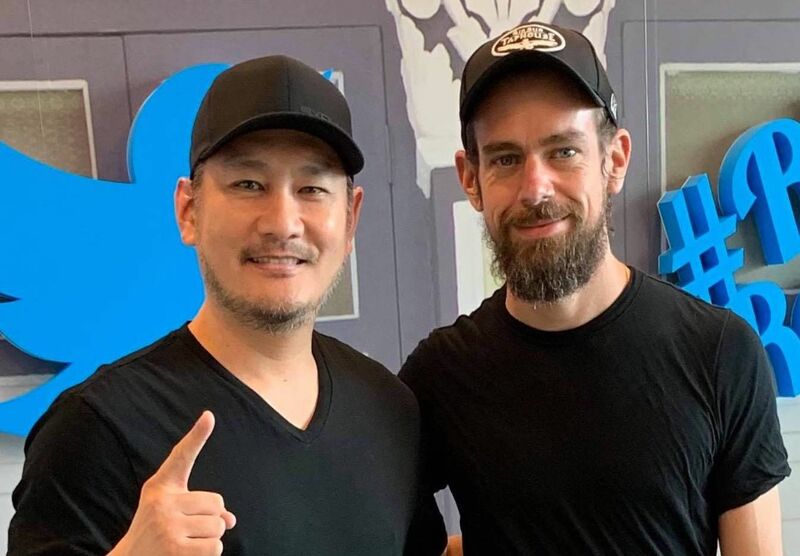 When people ask me for the secret to how ONE Championship raised over US$250 million from some of the world’s most blue chip institutional investors like Sequoia Capital, Temasek, Greenoaks Capital, and other blue chip institutional investors, I tell them that it was a lot of good luck. I am not being modest; it is the truth. Of course, there are many things you can do as an entrepreneur to maximize your odds of success in raising capital. However, it really does often come down to timing and luck. On the good luck side, I am blessed with the greatest business partners in the world in Saurabh Mittal and Hua Fung Teh. Bar none, Saurabh is the sharpest strategic thinker and greatest win-win dealmaker that I know in life. Hua Fung also ranks among the best business minds that I know. These two gentlemen spearheaded this whole process (among many other critical strategic duties at ONE Championship). Our bankers, Rippledot, also played a critical role in the process. Without Atin Kukreja, Debajit Sahu, and the rest of Team Rippledot, ONE Championship would not be where it is today. For me, Rippledot ranks among the world’s best investment banks such as Goldman Sachs and Morgan Stanley in terms of client focus and TMT market expertise. Throughout my career, I have had the good fortune of working with the best and brightest in both Silicon Valley and Wall Street. And I can say unequivocally that Saurabh, Hua Fung, Atin, and Debajit rank among the best in the world at what they do. Above all though, there is a strong foundation of real friendship; so it is no wonder why we always have so much fun together. Fun is probably the most important ingredient to success in life. 1) Integrity: For me, integrity means doing the right thing even when no one is watching. Do your best to live in a way that would make your mom proud. Integrity is essential for success in life and it is no different for investors. Before these blue chip institutional investors invested in ONE Championship, they did a massive amount of due diligence on my character, my values, and my past. Of course, they looked into my achievements in life too, but integrity was first and foremost. Investors want to see that integrity permeates throughout an entire organization, and that everyone lives and breathes it – from top to bottom. Trust is the foundation of every successful relationship in the world. It is no different here. Without a doubt, integrity is the most important value at ONE Championship for everyone who works here. 2) Authenticity: When Saurabh and I had breakfast with Michael Moritz (Chairman of Sequoia Capital), Douglas Leone (Global Managing Partner of Sequoia Capital), and Shailendra Singh (MD of Sequoia Capital) here in Singapore, I was absolutely blown away by their questions and ability to drill down to the most important drivers of our business. At the end of breakfast, Michael and Doug told me that I was an authentic founder who was leading a great business with a huge market opportunity. I did not quite fully grasp the depth of their words. Amazingly, a few hours later, Sequoia Capital graciously offered to lead the next round with a $100m investment. (Of course, they were already shareholders from the prior round, and had already completed months of due diligence). By their definition, an authentic founder is an entrepreneur whose calling in life is that particular business. They told me that when an authentic founder leads a great business model with a huge market opportunity, the equity has the potential to compound at high rates naturally over long periods of time. It is such a simple, yet brilliant concept. In my case, martial arts is what I love. And my martial arts is who I am. For as long as I can remember, martial arts has been my greatest passion in life. And I will be doing martial arts until my last day on Earth. Led by Sequoia Capital, our group of institutional shareholders ranks among the smartest value-add investors in the world with a track record of investing in startups that grew into multibillion dollar giants like Apple, Alibaba, YouTube, Google, Facebook, Instagram, WhatsApp, Airbnb, Oracle, Linkedin, and many other iconic startups-turned-giants. I will forever be full of gratitude for Sequoia Capital’s wisdom and belief. 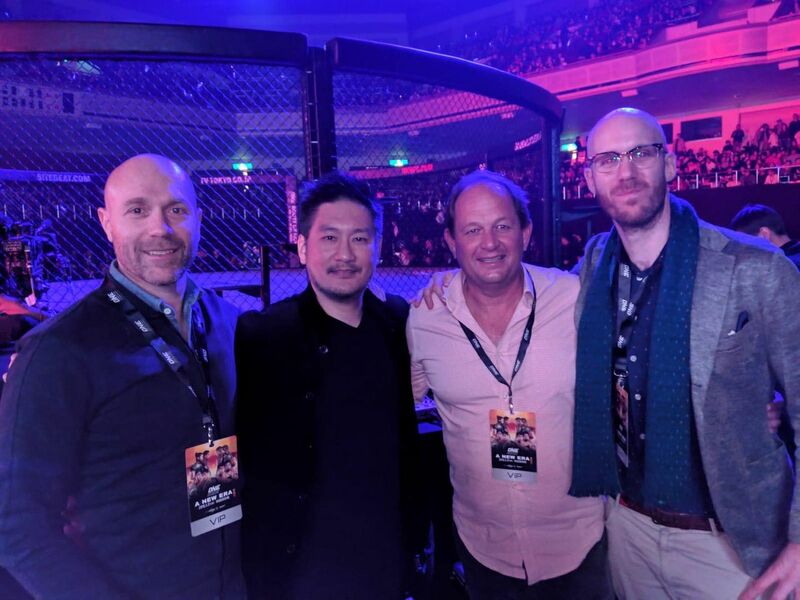 3) World-Class Leadership Team: Bar none, ONE Championship has the most globally-seasoned leadership team in the sports media industry in Asia. I would put our senior management team up against any senior management team in the world, even those from Fortune 500 companies. I have that much confidence in my team because I scoured the globe for the best and brightest leaders with deep domain expertise for each department; and I left no stone unturned by using the world’s best headhunters and my global professional network. I extensively interviewed and handpicked every single leader myself at ONE, (and in many cases, even convinced them to move here to Singapore). If investors are going to invest in a startup, they want to know that their capital is in good hands. Of course, experience and domain expertise alone are not key success factors. I look for the PHD factor too; I love working with people who are poor, hungry, and determined in spirit and attitude. Irrespective of one’s position in life, I believe that it is best to work with a PHD factor. What does that mean? It means work for every penny as if your pockets were empty. It means hustle for every deal as if you had nothing in your bank account. It means fight for every inch as if your company’s existence depended on it. To this day, I work, hustle, and fight as if my life were hanging in the balance. I don’t take anything for granted. Dreams are great, but nothing beats old-fashioned hard work. I need to see this rare PHD trait in a person before I make an offer. 4) Outstanding Product: I have spent thousands of hours on our product, and I still work on our product as if it is Day 1. First and foremost, I am a product-driven founder. My team will tell you that our product is an obsession for me. I look at every detail maniacally. I study every athlete on our roster for his/her character, athletic ability, world championship potential, marketability, and more. I look over every fight on every fight card before I give the final green light. I even obsess about the order of fights on a fight card to ensure that our fans get the very best experience. I study every pixel on our global broadcast with the proverbial magnifying glass. I walk throughout the stadium on fight night looking for minute details that can be improved and/or where we have made mistakes. I still watch every video produced by our team. The list of things that I do for our product is endless, but these examples are just some of the things that I do. 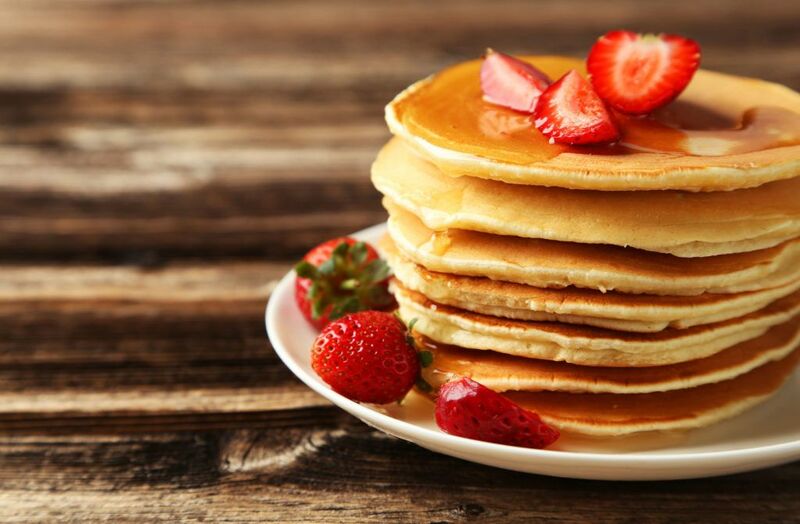 In a word, our product is my obsession. 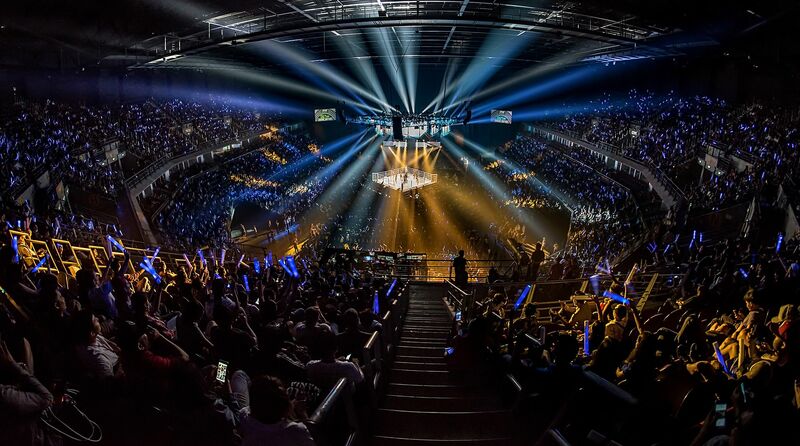 It is not an accident that ONE Championship has one of the best products of any global sports media giant today. My team and I are singularly obsessed with producing the greatest product in sports for our fans. And investors can see it, feel it, and breathe it. And of course, the ultimate proof of our product’s strength is in the chart below. 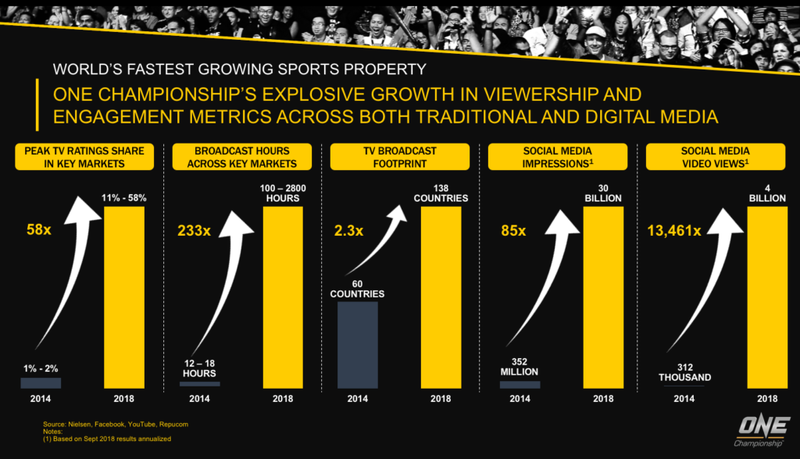 In a nutshell, ONE Championship has become the world’s fastest growing global sports media property in terms of reach, frequency, and engagement; these 3 pillars are the most important factors of success for any media property. 5) Unique Value Proposition: A great product is a prerequisite to startup success. However, the real magic is the uniqueness of the product versus those of competitors. From the very beginning, my team and I built ONE Championship as a platform business. Yes, our product ranks among the world’s best with the greatest martial artists on the planet, but our unique value proposition is that we have created a powerful ecosystem that benefits fans, athletes, gyms, managers, broadcasters, advertisers, sponsors, media, governments, partners, vendors, etc. From Day 1, our plan was to create a platform that would add tremendous value for all participants in our ecosystem; our aim has always been to create a universe in which ONE Championship helps everyone in the ecosystem, thereby making ONE Championship the center of the universe. If you look around Asia, ONE Championship is the only true global platform business in sports today. Smart money investors can see and understand that ONE Championship has a unique value proposition that is very hard to replicate. 6) Huge Addressable Market: Investors love a huge addressable market, but it must be realistically attainable. In our case, Asia has been the home of martial arts for the last 5,000 years. There are 4 billion people in Asia, and 2 billion of them are in the same time zone. ONE Championship is a celebration of Asia’s greatest cultural treasure and its deep-rooted Asian values of integrity, humility, honor, respect, courage, discipline, and compassion. Martial arts has been a part of our history, culture, values, and tradition in virtually every country in Asia. The biggest movie heroes of any genre are Jackie Chan, Bruce Lee, Jet Li, and Donny Yen – and they are all martial artists. 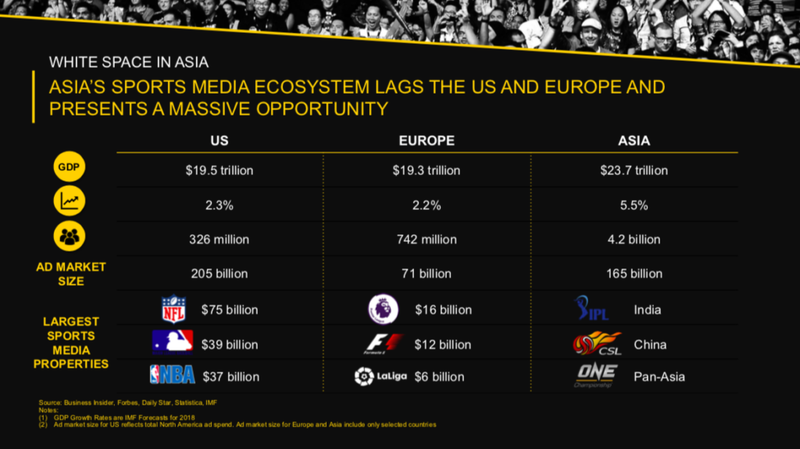 Equally important, if you look at the numbers that underpin the biggest global sports media properties in the West (see below), you will see that Asia’s numbers are similar. There is no reason why Asia cannot produce its first multibillion dollar global sports media property in history; and ONE Championship is already on track to achieve it. 7) Clear Mission, Vision, Strategy, And Execution Plan: A huge market without a clear mission, vision, strategy, and execution plan is meaningless. A clear mission ignites and unites a team to move in cohesive unity; it is the “why” of an organization and its people. A clear vision allows a team to drive through uncertainty, obstacles, setbacks, failures, rejections, and more; it is the lighthouse in the darkest sea. An intelligent strategy ensures the right priorities at all times for the most efficient path to success. A strong execution plan harnesses the power of the team and its ability to make the vision a reality. Before any institutional investor decides to bet on a company, it does a ton of due diligence on every facet to assess the overall probability of success. It is no accident that the most successful companies in the world have clear missions, powerful visions, intelligent strategies, and clear execution plans. 8) Good Business Model And Large Economic Moat: Luckily, I spent almost a decade on Wall Street as a global hedge fund manager, buying, selling, and shorting companies all over the world. As a result, I knew what a good business model was, and what a bad business model was even before I started ONE Championship. At scale, global sports media properties rank among the best business models on the planet. They are super asset-light, IP-heavy businesses with huge scaleability, huge margins, huge returns on invested capital, and huge cashflows. The biggest global sports media properties also have massive economic moats; they have huge, sustainable competitive advantages because they are platform businesses. For example, even if someone gave me US$1 billion to create another basketball league to try to dethrone NBA, it would be virtually impossible. NBA is too entrenched in society, business, and culture in the US (and many other countries); it has a huge complex ecosystem where it is the center of the universe. The same goes for ONE Championship. 9) Transparency: As an entrepreneur, I have learned that telling potential investors the good, bad, and ugly about my business is the best way to build trust. Every company has flaws. Every company has challenges. Every company has risks. Investors respect it when you walk them through the negatives and explain how you intend to overcome those negatives. So, when speaking to investors, my strong advice is to be open and transparent at all times. Of course, every fact and every figure must be 100% accurate and supported by data. Investors will do their own homework to verify everything, but my team and I always strive to be 100% open with all data and numbers. In summary, it doesn’t take magic to raise capital. Anyone can do it. Just remember that integrity, hard work, and transparency will go a long way to maximizing your chances of success at capital-raising.